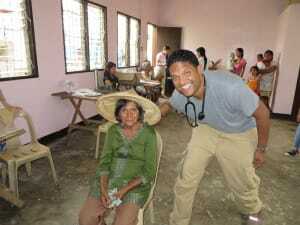 The experience I had in the Philippines was amazing. I am unsure what to write about. There are so many things that I want to talk about, including: the Filipino people and their resilience, the amount of destruction by Typhoon Haiyan (or Yolanda – the local name), the support from friends, family, and my community, the team of people I traveled with who supported me, mocked me, and made me a better person, the culture, politics, and craziness of disaster relief volunteers and organizations, the stable infrastructure of the Filipino government, or the medical need due to the typhoon. I could talk about any of these at length. I guess, I should really talk about my experience. I think the best way to do this is a picture document. It all started with a group of volunteers that have traveled with extensively. Leanna, is a nurse in Champaign, Illinois. She and I have worked together in Haiti twice and recently and Ethiopia. Brad Keating, a fireman/paramedic/dive and rescuer/SWAT team member is from Tampa Bay, Florida. This is our 3rd trip together. 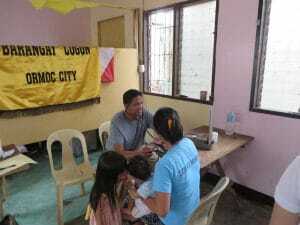 The date prior to leaving, we were told there were significant amount of medical volunteers in Tacloban, but there was a significant need in Ormoc, which is a city on the same island as Tacloban. 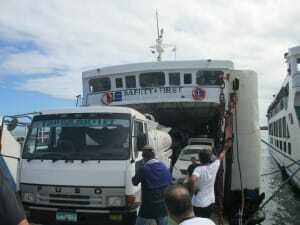 The first thing we did when we got into the Philippines was to try to get on a ferry to get to Ormoc. This was an adventure in itself. Five hours later, we got on the boat, with a lot of other people and trucks. We celebrated getting on with Cokes. 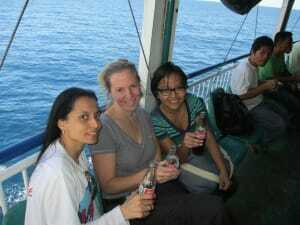 We were on the boat for around 5 to 6 hours. 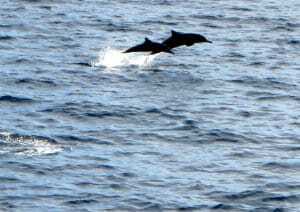 It truly was beautiful, with flying fish and even dolphins. 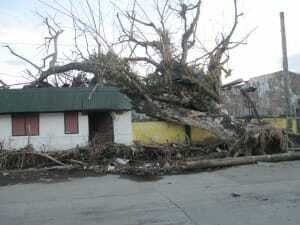 As soon as we hit the island, we saw the devastation. The truth is, although I have been to many countries and even disaster areas, pictures like this make you understand the severity of the situation. Our team consisted of a variety of different personalities and professions. We had Preceous, a pediatrician from Tampa Bay was born and raised in the Philippines when she was younger, Shazia, an emergency physician from New York, 3 awesome, badass Fireman from Seattle and Tampa, Leanna, an ER nurse, Mike, a Neuro Linguistic Programmer who specializes in PTSD, and our leader Chris, a paramedic who has led medical teams in Haiti, Japan and now the Philippines. 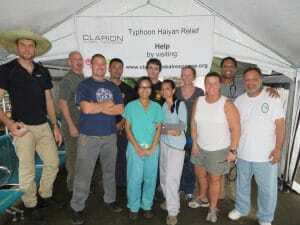 I say, with this team and our medical equipment, we were ready to help. The one thing that is so important to do when you go to a disaster area is to check in to the command center. You would be so surprised to know how many cowboy yahoos who come into these places, wanting to do such glamorous work, and even talking with local government agencies, and then they do their own thing, not really helping anyone but themselves. I’m always blown away by the amount of people who come to help, but really only help themselves. 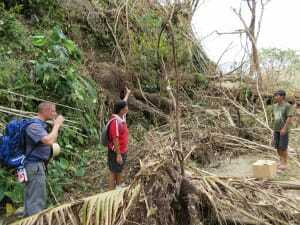 So this being said, the team went straight to the cluster meeting to assess the needs and desires of the locals. We were working directly with the Department of Health. The goal, is simple: To do what they want us to do, and do it well. 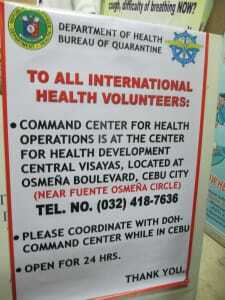 During that meeting we were tasked to help run a clinic within the city. The next morning, we came to the clinic prepared to work and see patients. When we got there, there was a line of around 30 people, waiting to be seen. Leanna and I got to do what we do best: Organize the clinic in a fashion that was efficient and effective. 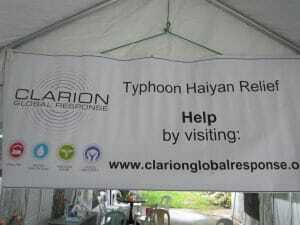 Under the tent, which was our clinic, we put down 2 chairs, one for the physician and one for the translator. Then placed another chair across for them where the patient was seen. Behind us, was a nurse and an assistant to do to the tremendous number of tetanus shots. Next, within the building, was a wound cleaning area with running water and a woman cleaning nurse. Further down the way within the building, was the pharmacist, who safely dispensed free drugs, which were given partly by the clinic and partly by us. 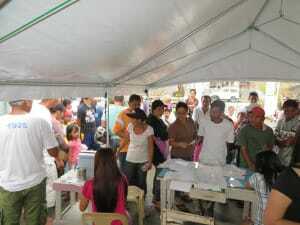 The system worked, and we saw around 140 patients on our 1st day. We saw a lot of abscesses. We arrived around day # 10 after the Typhoon, the perfect amount of time for the body to form the pus-filled abscesses that needed drainage. And that’s what I did, from babies to adults, I drained them. The patients we saw were very grateful. The diseases included, significant wound infections, pneumonia, puncture wounds needing tetanus vaccine, diarrhea from contaminated water, and then some of your normal coughs and colds. 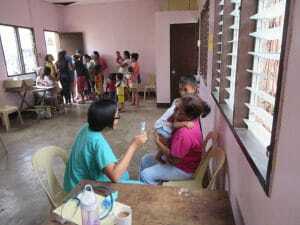 The best part of the clinic was that there were Filipino nurses, pharmacists, dietitians who were all willing to help and translate and give their services. Each one of them was appreciative of the volunteers. 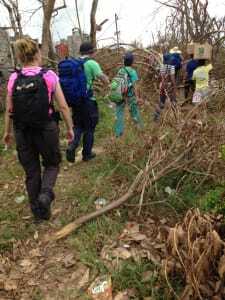 On other days, we were tasked by the Department of Health to assess small villages to see what their needs were. they told us that the US military did send helicopters to the surrounding areas to look for the needs of the other villages. Remember, there was no electricity in any of these areas. 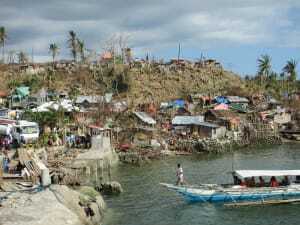 People were walking down from remote villages, which were unable to be accessed by cars, often walking over 50 miles, to get to the main city of Ormoc. 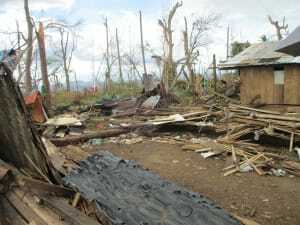 These little villages needed an assessment team and we were told, since we were health practitioners, we should expect to treat those who needed urgent or emergent care, and then come back down to the headquarters to let them know what the village needed. I’ll be honest, I’ve never done assessments. It definitely took me out of my comfort zone, but I was with firemen who did this for a living, so it couldn’t be that bad right? To say the hike was pretty hard, would be an understatement. The car went as far as it could, and we jumped out with a huge amount of water, some food, and large backpacks that contained medical equipment. There were fallen trees over the pathways which had to be jumped over, 95° temperatures, humidity over 100%, and my team who carried me (well not literally). When we got there, many people were waiting. Word spreads fast. 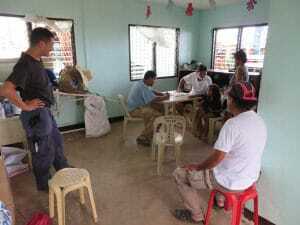 Within an hour, 30 more patients arrived. Preceous, the pediatrician, and I both saw over 40 patients each. Overall, we saw hundreds of patients, I incised and drained so many abscesses, and I feel we did some good work. 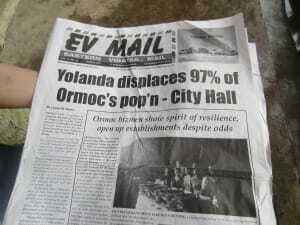 Unlike some of my other disaster experiences, I felt extremely optimistic about this country. The Filipinos are extremely hard-working, very passionate about their country, and very thankful for their international response they received. 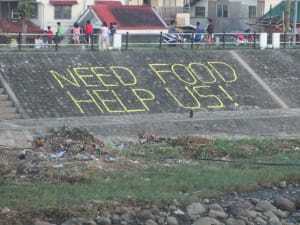 Although, all of them said they struggled, especially the first 5 to 6 days after the typhoon landed, they feel they are getting enough food and water. Their medical needs are not their biggest concerns currently. 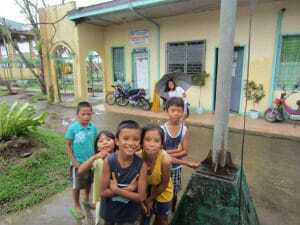 Their biggest concern is that many of them have no roofs, or very damaged roofs. Things such as tarps are the things they desire the most. I also feel they will get electricity back in one month. This will be very helpful to them. Overall, I have a new respect for this Philippines, the people, and the government. I am grateful for my family, community, department of emergency medicine at Northwestern Memorial Hospital and the generous donations I have received. I thank you all!